The Old Dame and her cast of characters are back at last and primed for another rip-roaring, stonking good season in our English home away from home. Together we have pulled together a great programme of concerts, cabaret, kids shows and kick-arse events including our infamous 'Festivals Club'. We are delighted to present our own house show, 'La Clique' - the red-hot, sell out success of past Edinburgh and Brighton Festivals and many seasons around the world. This is the best recommendation you can get... "if you do nothing else in May, you must not miss La Clique". Be seduced by the tent of dreams and fall in love all over again! See you again, again and again! Tickets for all shows are available on the Brighton Fringe website here. Telephone: 01273 917272. Tickets are GENERAL ADMISSION: a combination of seating and standing, with no seat guaranteed. 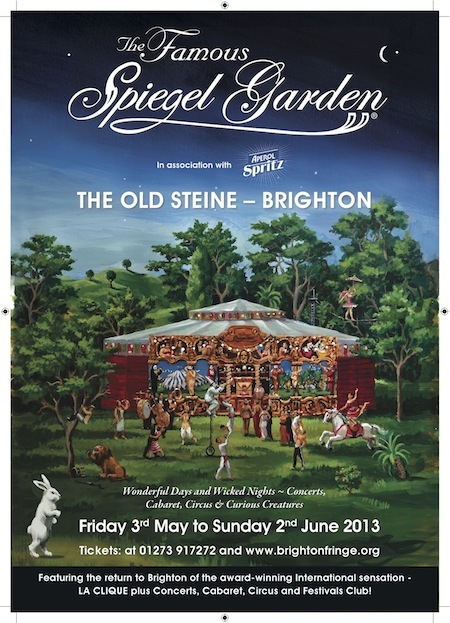 The Famous Spiegel Garden is located on The Old Stein and will operate every day from Friday 3rd May to Sunday 2nd June 2013, featuring concerts, Cabaret, Circus, family shows and the Festivals Club from 11pm every night.